Better outcomes for Indigenous organisations. Forums facilitated by IBA can assist in the development of investment principles to ensure better outcomes for Indigenous organisations. Indigenous organisations hold substantial assets from Native Title, land use and similar agreements, and there is an increasing desire among Indigenous peoples and other stakeholders to ensure that these assets are managed in a way that will best address the long‑term needs of the community. Every community has different circumstances, heritage and ambitions that influence investment decisions, and a common set of principles can help to identify the objectives and expected outcomes of each community. By following a framework of investment principles, communities can meet investment expectations, fulfil their needs and maintain community support for investment activities. The first forum, in December 2013, involved a group of eight Indigenous organisations that discussed the need and opportunity to develop a set of principles. 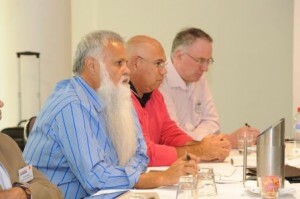 In June 2014, 21 Indigenous organisations, including the Kimberley Land Council, the New South Wales Aboriginal Land Council, Yamatji Marlpa, the Torres Strait Regional Authority, the Tasmanian Investment Corporation and Nyamba Buru Yawuru participated in the Growing with Governance Forum facilitated by David Murray AO, Chair, Financial System Inquiry. Mr Murray was also CEO of Commonwealth Bank from 1992–2005 and Chairman of the Future Fund from 2005–2012. The forum discussed the development of a set of Indigenous Investment Principles in greater depth. David Murray presented on three key components of investment principles: community circumstances, purpose and mandate of the investment, and governance and investment. establishing a drafting group to draft and develop an implementation plan. ‘The exchange of ideas and the opportunity to learn from each other were incredibly valuable’, said Gavin Brown from PwC Indigenous Consulting. ‘The organisations in the room were, in some ways, very different, yet their problems appeared to have common solutions’. IBA believes that these Indigenous investment principles – developed by and for Aboriginal and Torres Strait Islander peoples – will help to build momentum for long‑term sustainable investments that are underpinned by strong governance.